Eat your greens (and enjoy them, too) with this flavorful Shaved Brussels Sprouts Salad recipe with Citrus Vinaigrette! Brussels sprouts can get a bad reputation. If you’ve had bad brussels sprouts in the past, you’re less likely to give them another try. But this Shaved Brussels Sprouts Salad with a zesty Citrus Vinaigrette is so flavorful, you might just forget your previous brussels sprouts experiences entirely. The tangy citrus vinaigrette mellows the slightly bitter flavor of the sprouts in this Shaved Brussels Sprouts Salad recipe. Throw in some creamy avocado, crunchy pistachios, sweet dried cranberries and a bit of salty grated Pecorino cheese, and you have one tasty dish that could easily double as a side on burger night as well as be the lead-off hitter at your Thanksgiving Day feast. Can I make this brussels sprouts salad in advance? The hearty texture of the sprouts can stand up to the acid in the vinaigrette, so feel free to toss those together an hour or two before you serve the salad. But I wouldn’t add the avocado or other mix-ins until right before you serve the salad or you’ll run the risk of brown avocado (even with the citrus vinaigrette). 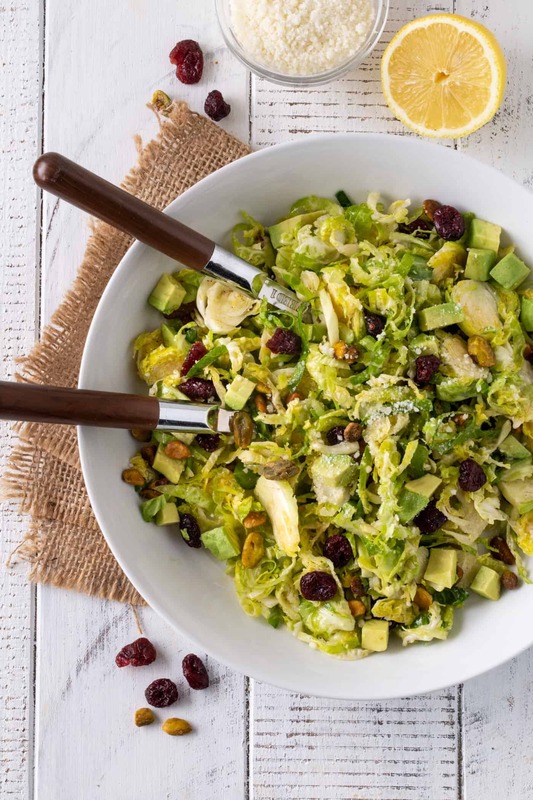 Any other shortcuts for this brussels sprouts salad? If you have a mandoline, by all means go ahead and slice these baby cabbages by yourself. I value my fingertips far too much to do this. My shortcut suggestion? 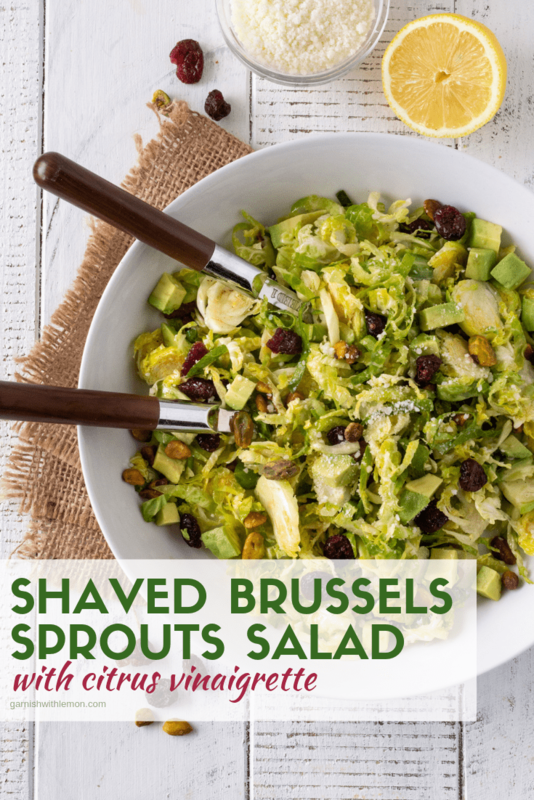 Buy the preshredded brussels sprouts at the grocery store and get this brussels sprouts salad recipe on the table in less than half the time of shaving the sprouts yourself. Not a craisin fan? Or maybe your don’t have any on hand? Tart dried cherries would be a tasty substitute for the craisins in this sprouts salad. Note: You’ll have leftover citrus vinaigrette when you make this recipe. The extra vinaigrette will keep in the fridge for about two weeks so feel free to make another round of Shaved Brussels Sprouts Salad or simply dress your next leafy greens salad with some of the leftovers. 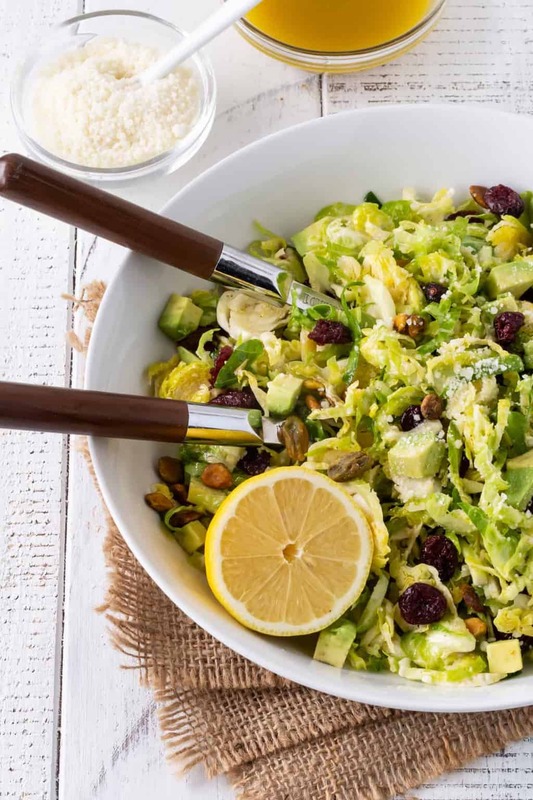 The bright citrus flavors are welcome any time of year – as is this Shaved Brussels Sprouts Salad recipe. 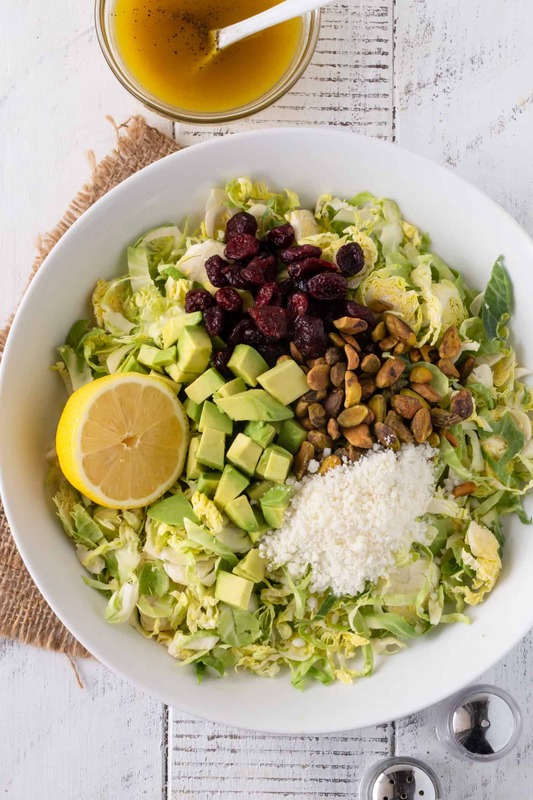 Add an unexpected salad to your side dish lineup with this easy, flavorful Shaved Brussels Sprouts Salad recipe with citrus vinaigrette. Combine juices, shallots, mustard, honey and salt in a small bowl. Slowly pour in olive oil and whisk until dressing is emulsified. Add additional salt and pepper to taste, if desired. Place brussels sprouts in a large bowl. Start by pouring half of dressing on sprouts and toss to coat. Add avocado, craisins, pistachios and cheese to sprouts. Gently toss. Add additional dressing, if desired. Serve immediately. Leftover dressing will keep for two weeks in the refrigerator. Perfect excuse to make more salad! Thanks, Sherry! We use Easy Recipe Plus for our recipes. I love shaved brussels sprout salads! Definitely going to be making your recipe.. loving the sound of that citrus vinaigrette especially. The citrus is just the right pop of flavor for those sprouts, Thalia. One of my new faves! loooooove this post! yummy – thanks so much!! I’m loving Brussels sprouts. So thanks for your recipe for the cold salad. Happy Thanksgiving. Happy Thanksgiving to you, too, Lydia!